Have you made a Bali Wedding Star quilt? Thread: Have you made a Bali Wedding Star quilt? I have my pattern(s), I'm going to be acquiring the fabrics for this and here's my real question. 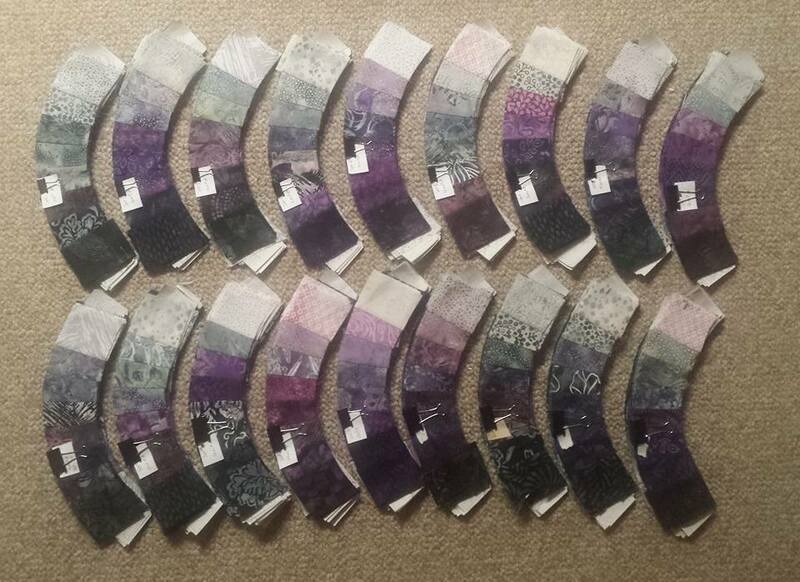 Did you buy a 'kit' with all the fabrics, select your own, or do something different? It's a little daunting with the #'s of all of the fabrics. And I'm not positive my LQS has a big enough batik selection for me to pick all of this out. If you bought your's online - can you please share where you got it? I know this is going to be a pricey investment...would rather do it right the first time. Thanks so much! I have not, although I love that pattern. If you don't mind buying full yards, you can get a great selection at Seawatch Fabrics online. Thousands of bolts has a lot too for decent price. At either of these places, it's about 40% off the price it is in my LQS. I think I would buy a fat quarter pack. You'll get at least 30 prints. Keepsake quilting sells the bed runner kit with a pattern maybe they have a separate kit with just the fabrics. I'm doing a DWR out of cottons, I love that pattern but it's out of my price range. Last edited by QuiltingCrazie; 04-26-2013 at 10:57 PM. I think I'm going to be in the same dilema - I want, or rather don't want, some colors predominant. I'm making a 7x8 (92x104). No class, live too far away from anywhere lol. I just got my pattern but have another big quilt to finish up before I get "started" on it. I have talked to Cookie at Batiks Plus about their 'fabric kits', I've also checked a couple of other online shops that carry fabric kits for various sizes. I have thought about going ahead and getting 5 or 6 different bali pops and then taking out the colors I don't want to include. I think that's going to give me enough for the arcs. I feel pretty sure my LQS will have batiks I can use for the background... and hopefully the stars. Would you please post a pic of your fabrics and any construction you have done? I'd love to see it! And thanks so much for your input! and Thanks Rachel & Katie! I have bought batiks from Connecting Threads & was very pleased with the colours and quality. I have not made this quilt, (too advanced for me). But I have seen a kit for it at Quilting by the Bay. I have no idea what colorway you are looking for. The kit says only 3 bali pops are needed, but you may want more. Last edited by Elise1; 04-27-2013 at 07:02 AM. I am binding mine this weekend. A King, God help me!! I did the original pattern not the updated one. It should be much easier for you. I used Bali pops and a kit but then I added much more fabric. You will need to do some math but I would buy it separate. Assuming you are making the size that requires 3 Bali Pops, I would not buy the Bali pops. I think you would do better with third to half yards and strip cut. Bali pops are about 15 bucks a yard really when you figure it plus there were some colors I just didn't like. so three Bali pops is 2.5 inches times 2 times 3 which is 15 inches per color. I think you can get away with 2 inch strips to make the arcs, so I am pretty sure 1/3 yard of each color would do it. I think I used 30-35 prints for the arcs. At the quilt show in Cincinnati, there was a company selling first quality Batiks for 9ish a yard. I can get them here at about 10 a yard on a shop hop or a sale. I would make the trip into a BIG shop or use somebody like Hancock's or Beverly's or Thousand Bolts. There is no reason to pay more for the 1895's than 9-10. I needed an entire bolt for the backing. Good luck! I also did it on my own. You MUST be very organized. My King with flying geese border was about 3000 pieces. Make sure you have the newer pattern. Last edited by seamstome; 04-27-2013 at 08:59 AM. Seamstome I would love, love, love to see pictures your baby all done and pretty. Gives me hope that this beast will get done. I have some pictures of my progress but not of all the of it. I will try to get more of each set today. Here is what I have, if you have questions I am happy to offer what I learned in class. Just looked at that patten as I wasn't immediately familiar, and oooh, I want one! BUT, I'd have to pick my own fabrics vs a kit. Not sure which fabrics I'd select though! How did everyone make out with their quilts? I have everything I need except the fabric I am going to try and pick fabrics from my large stash of Bali pops bought at an estate sale and stash. The cost of everything is so much! Fabric Fanatics--fine service, prices in the sale "bin" are great and the selection is awesome-group by color so it's not as overwhelming, too. And only batiks. I am currently in the middle of making the "Bali Wedding Star" quilt. I'm doing an 8 x 8. I thought about doing a 7 x7, but I didn't like that the stars weren't symmetrical, so I went bigger. I am ready to start piecing my blocks together. I'm so excited! 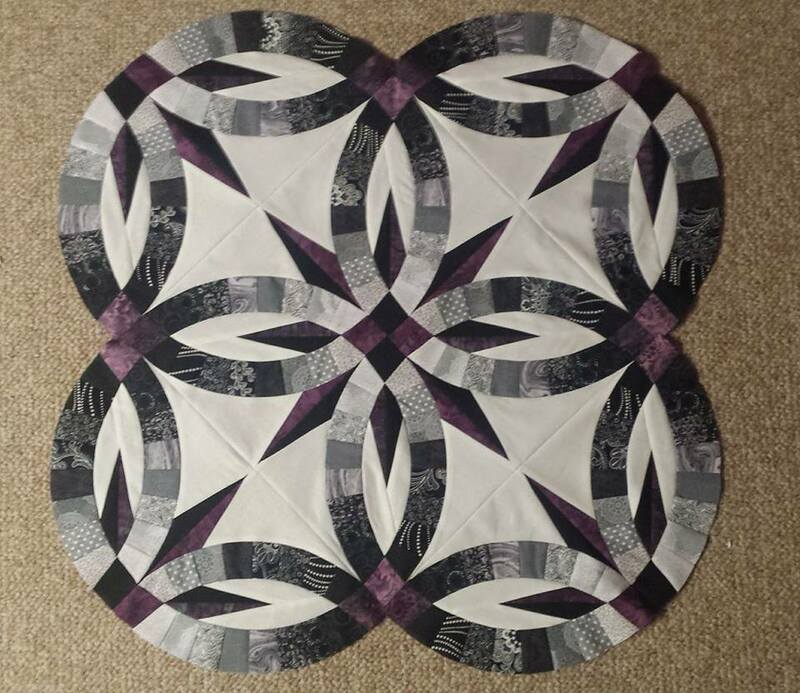 This is definitely an expensive project, but I fell in love with this pattern the minute I saw it and I knew it was my "someday" quilt. Well, "someday" is finally here and I LOVE it! I purchased most of my fabric online. I bought 2 Bali pop sets (40 pieces each) and 2 Bali Poppy sets (20 pieces each). There were a few fabrics that I didn't particularly like, so I purchased additional batik prints at my local quilt shop to fill in. The star fabrics and background fabrics I bought at the quilt shop as well. 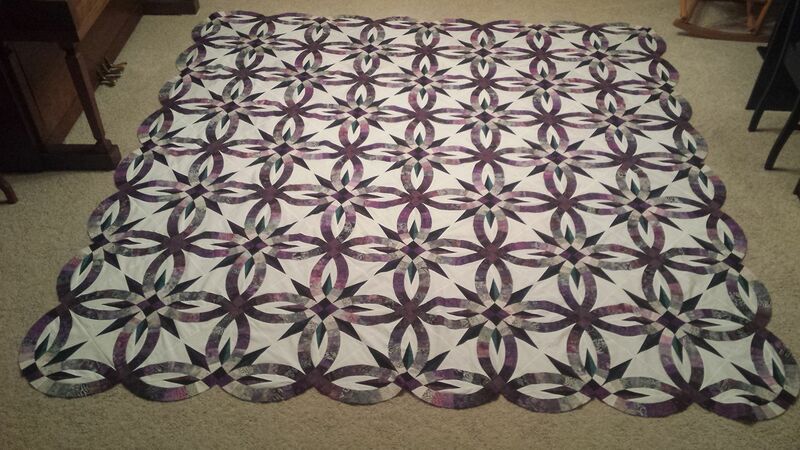 Before I started my "big" quilt, I made a sample 2 x 2 quilt just to familiarize myself with the process. I was very pleased with the results. I'm doing 1 color for the background. I couldn't find many white-ish/grayish colors to use for the background, so I just decided to go with one. I'll include a couple pictures... one of my 2 x 2 quilt and a couple color ring sets. I'm excited to continue the next steps of this process! This is going to be STUNNING! I'll be following your progress! 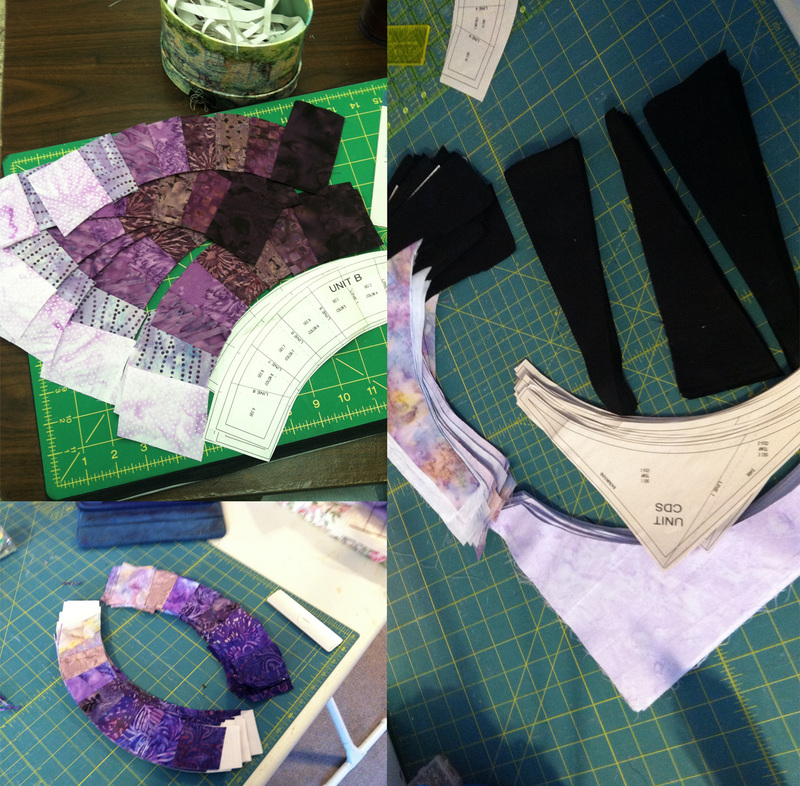 Do you have any tips for doing the binding? Did you square up the edges? I just finished mine, and I didn't swuare them up. I assume I'm going to need bias binding for this. Wow - very nice work! Yes, you will need bias binding (and a bit of patience) to bind those curvy edges. I like it, though... I think it will look great! I went with my own colours, and had a quilting store cut up all my fabrics for me. If you can do it that way, just find any store in your area that does quiltworx patterns and they know exactly what you are talking about!!!! Auntierah09 - I'm going to be squaring mine up! I'll be posting the updates in the thread I mentioned above! That is SPECTACULAR and yes I am shouting! One beautiful quilt top. This is a beautiful pattern. You all are doing amazing work at putting it together. There are some very talented people on this board. I love seeing what everyone is working on.